Adam and I knew that if we wanted to really start taking this webcomic thing seriously, we needed to experience the world of comic conventions first hand. Neither of us had been to one before and we were both very curious. Luckily Wondercon in San Francisco was coming up pretty quickly, so we bought our tickets and then decided to figure out a plan of attack. After a lot of research and brainstorming, we decided that the best thing to do was to just go to have fun and get a feel for the scene. We wanted to meet some people who were also creating their own comics and if we got to promote Robots in the process then all the better. We assembled an eager street team and set off early Friday morning (click the jump to read more). The BART ride over was totally packed. One of the trains to San Francisco was out of commission so we had to cram multiple trains worth of people into one 5 car train before we were on our way. 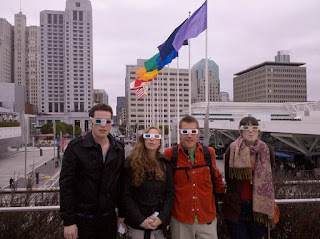 Jake, Nick, and Juliana wore their 3D glasses on the ride over and apparently the BART map looks pretty cool in red/cyan. Once we arrived in the city we headed over the the Moscone center. In retrospect we probably didn't need to get there as early as we did. Even though there was already a substantial line formed by the time we arrived we ended up waiting another hour and a half to finally get in. Juliana left to go meet with a friend and we took in the sights. Waiting in line did, however, give us the chance to talk to a really nice guy named Sammy who talked with us about everything from Battlestar Galatica, to what to expect from cons, to the best places to get late night food in SF. We gave him a pair of 3D glasses and he read through Robots! on Adam's droid. He was excited about how the 3D looks on a small screen so now we're starting to think about making a mobile version of the comic! Once we got in we wandered around the showroom floor. We didn't really have a plan, but there was so much to see we just kind of followed the things that caught our attention. The nice thing about getting there early was that we were able to have some really good conversations with some of the exhibitors. Over the course of the morning we met and talked with some really nice people (This was probably the most surprising thing for me - many people there were just as excited to talk with us as we were to them!). I quickly found the Tiny Kitten Teeth booth where I got a very cute button and sticker (but was a little embarrassed to say much more than, "I really like your work!"). We wandered over to Studiosb3's booth because we were attracted by his really lovely shadowboxes. 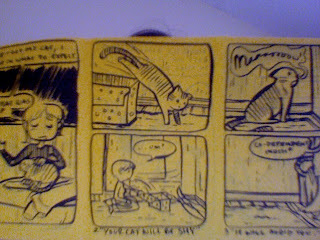 We then found our way to the booth of another Bay Area comic artist, Elle Skinner. She was very friendly and had a really charming illustration of a robot for sale. 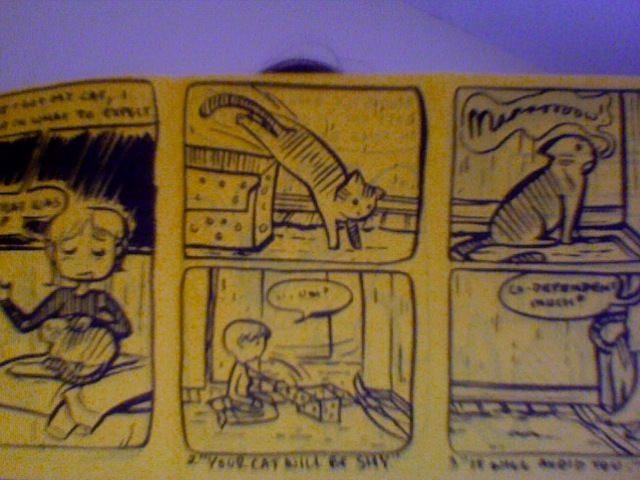 We ended up buying one of her mini comics about her experience adopting a kitten (robots and kitties - a kindred spirit for sure). I walked by her booth later that day and was a little heartbroken to see that the robot drawing had been sold - I should have snatched it up when I got the chance! We got a great rocket ship print for our space-themed living room from Pascal Campion and Nidhi's booth and Nick got a beautiful monster print. At this point we were all pretty exhausted and decided to leave the convention center to get lunch. After lunch we met back up with Juliana and her sister and got some photos taken with The Hulk. We then decided to go to a panel. We decided on the "Queers, Comedy, and Camp: LGBT Humor Comics" panel hosted by Prism Comics. Originally we kind of chose it at random, but I'm so glad we went - the panel was GREAT! It was made up of Ed Luce, Joey Alison Sayers, Rick Worley, Sean Seamus McWhinny, and Brian Anderson. We sat in the back thinking we might want to leave early to go back and check out the showroom more but the panel was so good we didn't even think about leaving once it started. In fact, it seemed like our whole group was laughing harder than most everyone else in the room. They discussed a whole host of questions about queer identity, writing about personal material vs building a mainstream audience, and about accidentally building a furry fan base. The panel had really great chemistry together and what could have been a pretty dry Q and A session turned out to be hilarious and inspiring! After the panel we had time to check out the floor one more time before we had to leave. 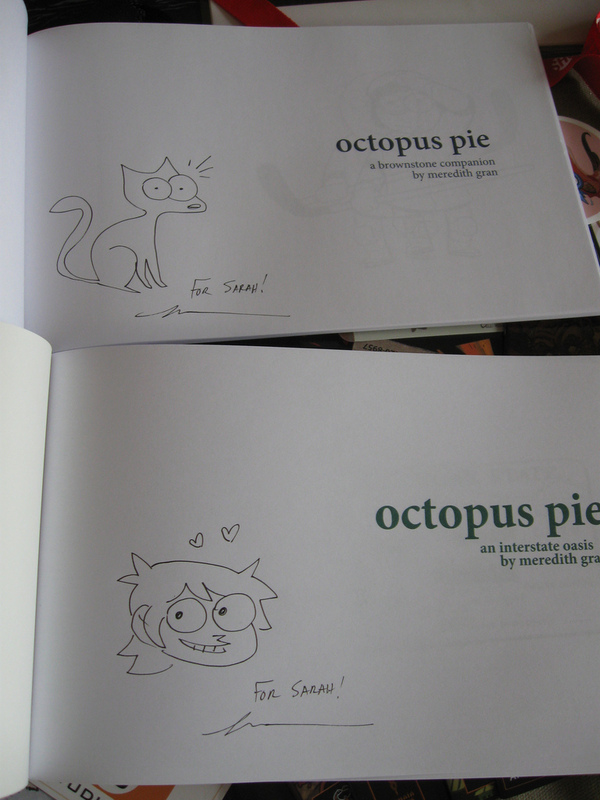 We walked by booth 425 and I was excited to pick up two of Meredith Gran's Octopus Pie books. 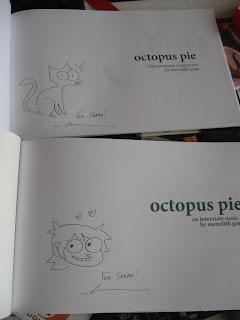 She was super friendly and was nice enough to sign and draw in the covers of both of my books. The ride back on the BART was kind of a blur. We were all tired and a little overwhelmed and I think everyone went back to our respective apartments and crashed. We had originally intended to stay longer to attend the Cartoon Art Museum's benefit for Ed Hannigan but we just couldn't do it. Adam and I fell asleep as soon as we got home and woke up at 9pm and recouped by eating popsicles and watching Boy Meet World. Talking it over I think we both felt very inspired and very overwhelmed by the whole experience. It's easy to get caught up in worrying about how much further we have to go to be able to show our work at a place like Wondercon. Between just the two of us, Adam and I have been working on Robots! for a very long time now, but really we've only been online for 2 months (and are only 11 pages deep). I have to keep reminding myself of that to keep things in perspective. 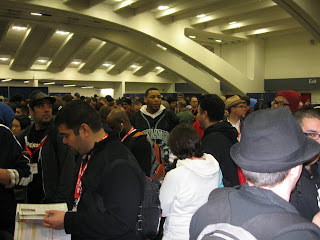 The best thing for me about the whole experience was to see just how nice the indie comics community can be. Talking with everyone on the floor, I felt like they were all genuinely interested in hearing about what we were doing. I know that we have a great story to tell and I hope that as we get deeper into it people will begin to find something in it that resonates with them. If we can keep ourselves on schedule (and I do think we can) we'll be done with the whole first book by next winter. 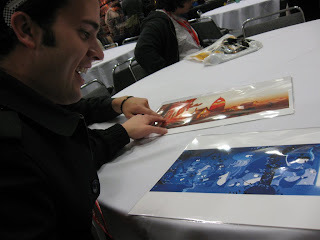 Maybe at Wondercon next year we'll have a little more to show and share with the rest of the community.